Chrome’s data compression proxy is available only for Android and iOS. This feature sends the web traffic to your device by reducing the size of HTTP packets using various compression resources. Jerzy Glowacki figured out a way to bring this cool data compression feature to desktop version of Google Chrome. He also released his extension that brings this data compression proxy to your desktop version of Chrome. This is an experimental extension so may contain bugs. It is opensource so you can also download and check the source code. Download Data Compression Proxy extension from Chrome web store. After installation, it adds an icon in omnibar. Click on this icon to enable the data compression feature. If the icon is green, it indicates that it is enable. If it is red, it is disable. This extension sends all HTTP request traffic through Chrome Data Compression Proxy server to speed up your web browsing. If there is an error, it automatically disable it for 30 seconds. 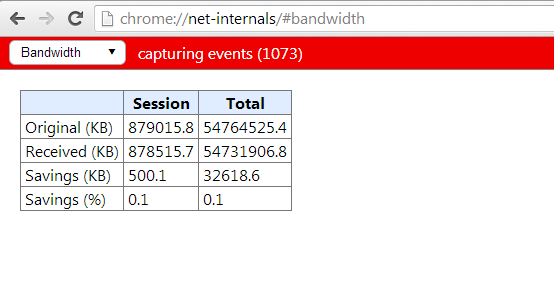 You can also check the data savings by visiting chrome://net-internals/#bandwidth. Here you will see what data it has saved. This extension is very helpful for those who use data cards with limited internet bandwidth plans. This will help them in reducing the data usage and increasing the web browsing speed. Try this extension and share your experience.